Denis Malgin, 21, has appeared in 14 games with Florida this season, recording five points (1-4-5). 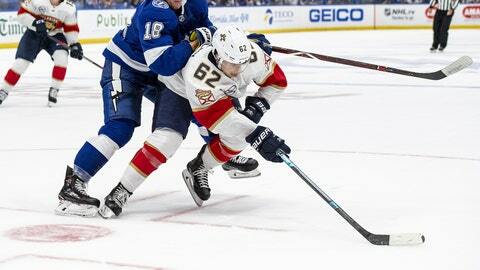 SUNRISE, Fla. – Florida Panthers President of Hockey Operations & General Manager Dale Tallon announced Wednesday that the club has recalled forward Denis Malgin from their American Hockey League affiliate, the Springfield Thunderbirds. Malgin, 21, has appeared in 14 games with Florida this season, recording five points (1-4-5). The 5-foot-9, 177-pound native of Olten, Switzerland has played in 112 career NHL games, all with the Panthers (2016-17 to 2018-19), registering 37 points (18-19-37). He was originally selected by Florida in the fourth round (102nd overall) of the 2015 NHL Draft.